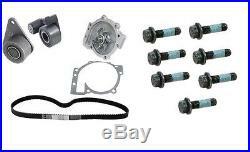 Volvo 850 C70 S70 V70 Timing Belt Roller Tensioner Water Pump Kit. This Kit Contains: One - 9180954 - Continental Engine Timing Belt From Engine 131155; with Automatic Tensioner One - 8630590 - INA Engine Timing Belt Roller From Engine 1311155. 53mm One - 9135036 - INA Engine Timing Belt Tensioner Roller From Engine 131155 One - 30650751 - Aftermarket Engine Water Pump From Engine 131035. Includes Gasket Seven - 985151 - Water Pump Bolts 985151 7x 25 mm. 9180954 / 8630590 / 9135036 / 30650751. Please read below before purchasing. Please review our interchange below, to verify proper fitment. The item "Volvo 850 C70 S70 V70 Timing Belt Roller Tensioner Water Pump Kit" is in sale since Saturday, September 07, 2013. This item is in the category "eBay Motors\Parts & Accessories\Car & Truck Parts\Engines & Components\Timing Components".